The final of the 67th Japan Collegiate Baseball Championships was played at Meiji Jingu Stadium on June 17th, 2018 and Tohoku Fukushi University of Sendai Big-Six University BBL beat International Budo University (Chiba Prefecture University BBL) 6-2 to capture their first crown in 14 years. 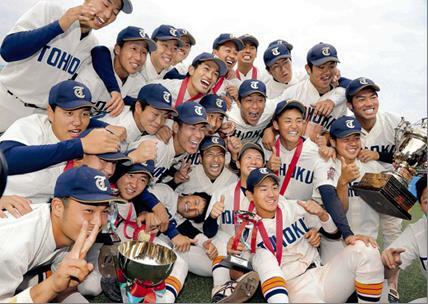 27 Regional Champions of University Baseball Teams in Japan joined in the elimination tournament at Tokyo Dome and Meiji Jingu Stadium for 7 days from June 11 to 17, 2018. Hayate YOSHIDA of Tohoku Fukushi awarded MVP, followed by Leading Hitter .636 Daiki KAWAI of Keio Univ., Best Pitcher 0.00 Yuki TSUMORI of Tohoku Fukushi, Fighting Spirit Prize Yuta HIRAKAWA of Budo and Special Award went to Miyazaki Sangyo-keiei University Team. All-Japan University Baseball Association will hold a trial inviting 42 candidates in Hiratsuka City from June 22 to 24 and will announce the 24 roster for 42nd U.S.-Japan Intercollegiate Championship in U.S.A. and the 29th Harlem Baseball Week in Netherlands, both in July, 2018.